We're reaching cope levels never before thought possible. Despite Robert Mueller's report falling flat the leftoids at Saturday Night Live are telling their desperate audience the whole Russia collusion narrative was totally legit and Drumpf is finished. They decided to run with the whole "AG Barr just made up his summary" angle and suggested there might be some collusion still hiding in there somewhere we're just being kept in the dark on. 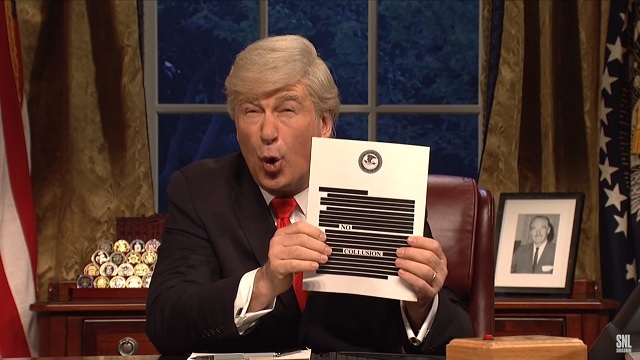 The sketch showed Mueller reading the almost 400-page report, Attorney General William Barr, played by Aidy Bryant, summarizing it and Trump live-tweeting his reactions. [...] As for allegations of Trump-Russia collusion, De Nrio as Mueller said there were “several questionable instances involving the president's team” and noted that 34 people were indicted during his investigation. They ended the sketch with Mueller saying he "can't wait to see what the Southern District of New York has in store for Trump." Watching these idiots cope is funnier than any sketch SNL has aired in years!